After decades of poor results through the industrialized food system, it seems we are hearing about a homegrown revolution more and more. Indeed, growing one’s own food is a certain means of knowing exactly what is going into the many plants and animal products that go on the table. But there are many challenges that don’t make this simple task as easy as it may seem. Land, soil health, and seasonality all present challenges to the ideal of sowing the seeds of our supper with our own two hands. Thankfully there is a way to grow enzyme-rich raw vegetables right in the home kitchen without the need for soil or land. Some seeds, water, and simple equipment are all that is necessary. 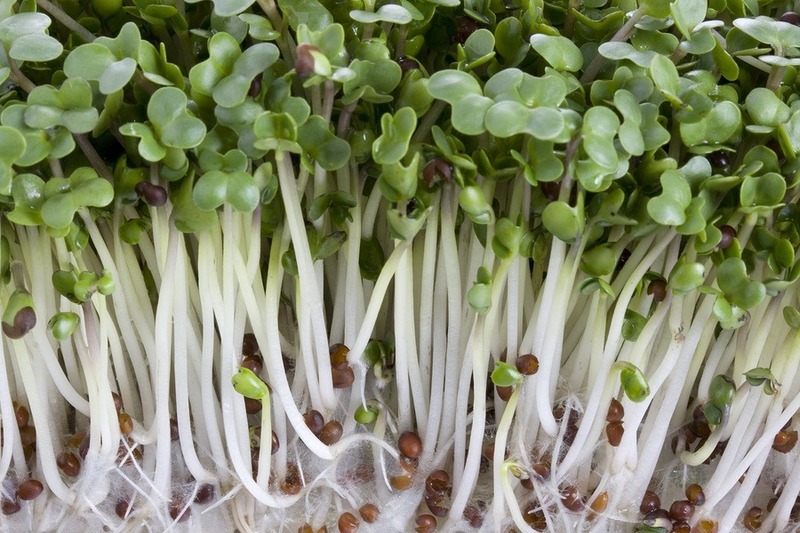 Sprouts have long been touted for their many health benefits and for good reason. Rich in bioavailable nutrients, the young shoots of the seed add enzymes and all the benefits of raw food to your meals. What’s even better is that sprouts are quite simple to make. With some very basic equipment and a handful of seeds, a quart of sprouts can be prepared in the home kitchen within days. When choosing seeds specifically for sprouting, be sure to look for untreated, organic sprouting seeds. Commercial seeds intended for soil often contain chemical inhibitors which can block the ability of the seed to sprout. 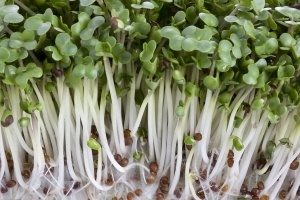 Growing sprouts for meals is not unlike the sprouting process that happens when seeds are put into moist soil. 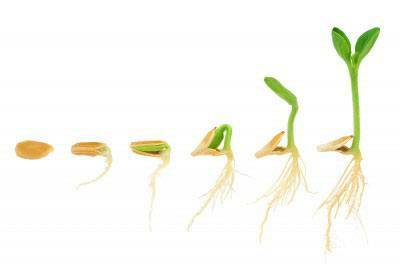 If kept moist and given the proper care, the seed eventually gives forth a sprout. This sprout is tiny at first – like a small tail. After 12-24 hours that little tail grows into a longer sprout of 1-2 inches. With exposure to indirect sunlight the sprouts begin to fill with chlorophyll and green up. The first part of sprouting, once the seeds are chosen, is to choose equipment. The most basic way to sprout seeds is with a quart glass jar and a sprouting screen. Another option is to use a large strainer with very small holes. The first step is to soak the seeds for 6-12 hours. Smaller seeds require less soaking time, but if you are dealing with a mix of seeds with varying sizes it won’t hurt to soak all of them for 12 hours. A volume of 3-4 Tablespoons of seeds will fill a quart jar with full-grown sprouts. Once the seeds have been hydrated through soaking, strain the water from them, rinse with fresh water, and strain again. They are now ready to sit for 8-12 hours before rinsing again. During this time the seeds need airflow. In order to achieve this, prop the quart jar upside down at a 45 degree angle inside a larger bowl. This allows any residual moisture to drain off. If using a strainer, simply place it over a large bowl that will allow air to flow all the way around. Cover this with a tea towel or cheesecloth to keep off any debris or insects. Once the first 8-12 hours is up, the seeds need to be rinsed and drained once again. Simply proceed as above in 8-12 hour intervals. After the first 24-48 hours of soaking, rinsing and draining tiny tails will begin to emerge from the seeds. This is the beginning of the sprouts. After another 24-48 hours the sprouts will grow into longer 1-2” sprouts. At this stage it is a good idea to make sure they are getting a bit of indirect sunlight. Once the sprouts are to the length you prefer and have greened up enough, they can be eaten immediately or stored in the refrigerator for 5-7 days. If planning to store in the refrigerator, try to time the storage after the sprouts have had at least a few hours of drain time since the most recent rinse. Sprouts need to be kept as dry as possible to avoid mold. Air flow is also important so storing in a permeable container such as a jar with a permeable lid is ideal. Add sprouts to sandwiches, mix into salads, or top your favorite dish with a handful of sprouted goodness.